After the interview, we kept in touch sporadically via phone and email, so when I interviewed Betty, the intervening years melted away. Betty is a petite, lively woman in her mid-80s who still has a zest for life. (The picture taken in her home shows Betty’s dazzling smile.) As a nutritional expert, she has influenced many people with her books and her website (www.betty kamen.com), the latter of which provides one concise, healthful hint in each postingâ€¦very easy to digest…a nutritional nugget. Check it out for more information on Betty’s background. When Betty and her husband Sy lived in New York, they were photographers, but then she was able to have her own talk show on health, and eventually went back to school in her late 50s to obtain her PhD in nutrition, to give her credentials in the health field. Her PhD. thesis on nutrition during pregnancy became a book published by Prentice-Hall and Betty was off and running as a nutrition expert. However, the AMA took her to task when she stated that a deficiency in folic acid could cause problems in pregnancy. The AMA disputed that, only to find out later that Betty’s research was accurate. 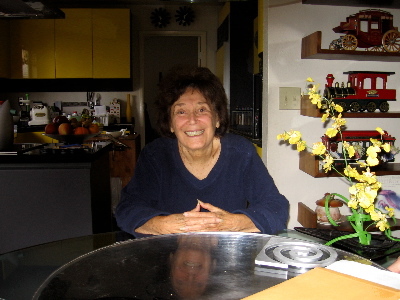 Betty has published several books, most of them self-published, because she found a ready source for distributing her books and could maintain control over the content. They are available through Betty on her website printed above. See, Betty really is an expert! In December some of us celebrate Christmas, some of us celebrate Hanukkah, others Kwanzaa, and still others the Winter Solstice. Actually, I celebrate Hanukkah and the solstice, so the holidays are not mutually exclusive. So whatever you are serving as your main course, feel free to use some of these salads and side dishes to brighten up your holiday table. wash zucchini and cut into 1/2″ slices. 2. 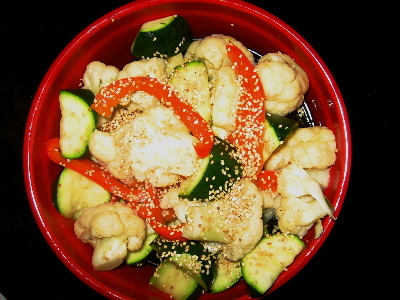 In a large steamer with the water already hot, add cauilflowerettes and cook for about 5 minutes; then add bell peppers and cook another 3 minutes; finally add zucchini and cook for 3-5 minutes. The idea is to have all the veggies be crunchy-tender, so depending on the size of your pieces, your steaming times may be a little more or a little less. 3. Remove veggies from steamer and run cool water over them, right from the steamer if it has a center handle. Place in a bowl and pour dressing/marinade over them. Refrigerate until ready to use, although you can also serve them warm with the dressing right after cooking them. 1. Wash and cut all the organic fruit into bite sized pieces, removing seeds and stems. Kiwi will be the only one to have its skin removed. 2. 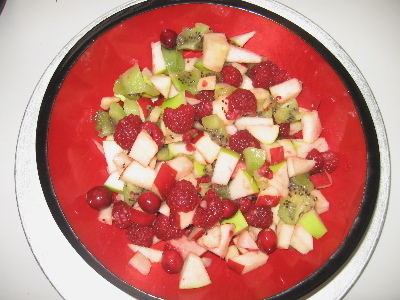 Place all the fruit in an attractive bowl and pour a small amount of juice over the fruit. 3. Sprinkle on snow (coconut) and serve. Note: If you have leftover salad, the next day you may have to add more juice to moisten it. * I used organic potatoes with thin skins, so I did not peel them. If the skins are tough, you may want to peel them, organic or not. 1. In small batches, place potatoes, carrots, leek and garlic in the food processor or food mill and grind or grate. 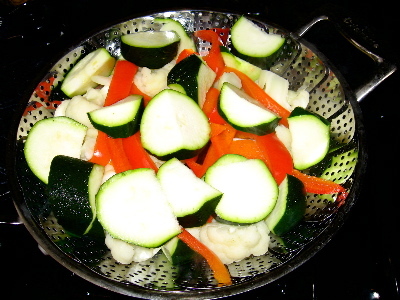 As you finish each batch, place the veggies in a colander over a bowl to allow the liquid to drain. 2. When all the veggies are grated, press them down with a spoon or your hand to remove any excess liquid. 4. Remove drained veggies from colander and add to egg mixture, combining well. Finally, add baking powder and mix again. The latke mixture should be thicker than regular pancake batter because the veggies are coarse and grated. If the batter is too runny, add a little more flour or matzoh meal. 6. Bake at 350-375 degrees F. for about 30-45 minutes, until a toothpick comes out clean and the kugel muffins are crisp around the edges. 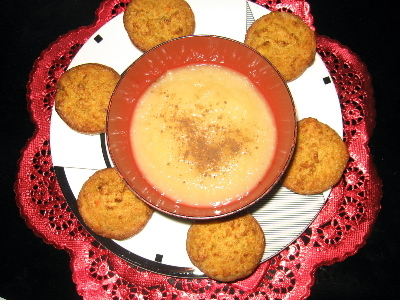 Serve with sour cream, yogurt, or applesauce (as in photo). Yield: For my first batch I made the muffins too large, so I reduced the portion for the second batch to bake all the way through, so I am uncertain of the yield, but more than one dozen and less than two. This recipe is a variation of one served at Thanksgiving, thanks to Jay, my son-by-marriage. I added red and black olives, because Kwanzaa colors are red, black, and green. I was unable to buy fresh, organic red peppers, so I purchased fire-roasted organic red peppers from Mediterranean Organic. 2. In a small bowl, whisk together oil and vinegar and pour over peppers and olives. 3. Grind or crush the seeds and herbs in a food processor, nut grinder, or with a mortar and pestle. Add to pepper and olive mixture and mix well. Cover and refrigerate overnight. 4. Yield: 1 1/2 . This keeps as long as one week in the refrigerator. Recipe Note:The organic roasted red peppers are featured in Products & Services. 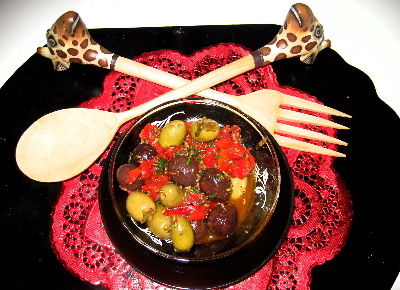 Photo Note: The giraffe salad server set is a birthday present from my friend Amparo. She knows I collect giraffes. Soon I will have a giraffe collection worthy of the Smithsonian! You are currently browsing the Menupause weblog archives for the year 2007.